In our view, it is finally time to go out and enjoy a nice and relaxing spring walk in the park. If you are wondering what we are talking about, let us explain it in short: Verizon and Nokia have announced a new device, “Just in time for spring”. What is on our mind is the long-anticipated slim and stylish clamshell, the Nokia 7205 Intrigue. The device features a black color solution, which would appeal to the style-conscious users. It looks like one of the key features of the new Nokia is its external display, which completely blends with its mysteriously-dark front. You will be able to view incoming text messages, play songs and use the snooze option of the alarm right through the external display. 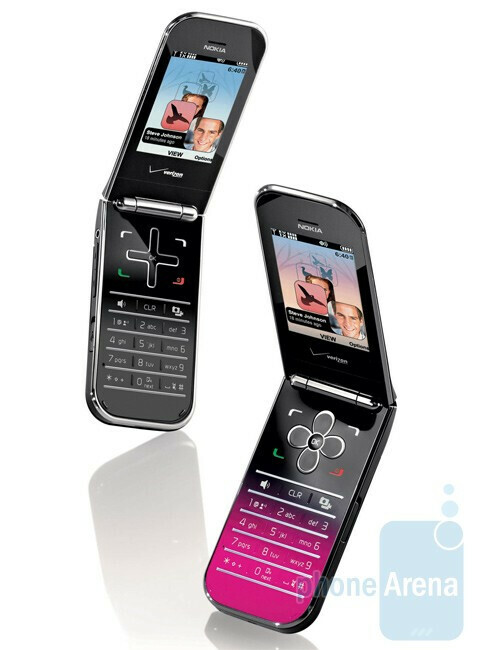 The handset is available with two color variants for its keypad: silver-fade and pink-fade. As to its other features, the Intrigue offers a touch-sensitive camera/video button for its 2-megapixel sensor, uploading of photos to popular social networks, Bluetooth and the all new Habitat mode. Basically, it arranges your contacts in chronological order and allows you to view the whole history of calls and messages with a certain one. The Intrigue is also an environment-friendly phone, coming in a box made of 100 percent recyclable materials. In addition, the device will display a warning message that you should unplug the charger from the wall once it is fully charged. The Nokia Intrigue is now available in Verizon stores and online at big Red’s virtual shop at a price of $129.99 after a $50 mail-in rebate. Sweet looking phones. Kicks the crap out of the razr...only wish the screen was a TAD bigger.